Neuroinfections by viral pathogens are an increasing threat to humans with often severe consequences for the infected such as extensive brain damage, disability and death. Virus families causing human encephalitis include the flaviviridae and alphaherpesviridae. Especially members of the flavivirus family (e.g. dengue virus, WNEV, JEV, TBEV) represent both a medical and national economic challenge, expected to increase significantly in future also in Europe due to the aging society, climate changes and globalization. Tick-borne encephalitis virus (TBEV) causes more than 2.500 annual infections in central Europe with approx. 14% of severe courses and 3.6% deaths (WHO fact sheet 2014). Herpes simplex virus 1 and Varicella Zoster Virus, are the most frequent pathogens of sporadic encephalitis. The high sero-prevalence of both viruses with over 95% and the potential severity of brain infection make them key targets for public health. Despite acyclovir as available specific antiviral drug, encephalitis patients still are at high risk to die (20%) and more than 50% survive with considerable neuropsychiatric sequelae. Moreover, the mortality in immunosuppressed patients is near 100% despite treatment. Our research group aims at resolving pathomechanisms of virus infections with focus on the neurotransmission of pathogens at the blood-brain barrier and on the host-virus interaction (Lenhard Brain Res 2013). Increasing evidence shows that the host response to pathogens is equally - if not more important - in defining the clinical outcome of a given infection. Host factors ranges between single gene mutations mediating increased susceptibility to a given virus (e.g. Unc93B and high risk for herpes simplex encephalitis), polygenetic influences and multifactorial immunological conditions as old age or immunodeficiency. For example, brain irradiated individuals are more susceptible to and develop more severe herpes simplex encephalitis (Jakob Crit Care Med 2012) or diabetes mellitus serves as risk factor to develop severe encephaloradiculitis in TBE (Lenhard PLOS One 2016). So far, available data on polygenetic virus-host interactions however are essentially all based on in vitro- and/or animal models crucially neglecting the human immune system with its individual genetic context. The group has isolated numerous wild-type viruses and mutants (TBEV, HSV-1) and has available a range of genetically modified HSV strains to address aspects of these questions in vitro and in animal models. In the past years we could isolate TBEV from natural foci which attract attention with especially severe autochtonic cases of TBE. 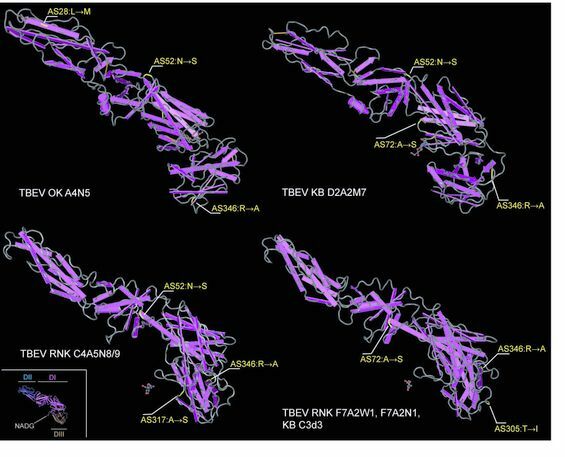 Sequencing data showed mutations in the viral glycoprotein E (pE; see figure below). Further experiments aim to clarify the phenotype of these mutations in vitro and in vivo. Furthermore, by investigating infectious meningoencephalitis, we performed a comparative quantitative analysis of the brain inflammatory response (“inflammome”) to viruses and bacterial to identify pathogen and host specific patterns as well as to specifically address downstream inflammatory events using gene set enrichment and pathway analyses (GSEPA; Kraft J Mol Med 2016). Further future work will focus on extended inflammome analysis in brain infections in vivo at the proteomic and transcriptional level as well as in vitro using BBB models to simulate disintegration and dysfunction of the BBB on the cellular level (Collaborations with Susanne Bailer, Dept. of Interfacial Engineering, Institut für Grenzflächenverfahrenstechnik und Plasmatechnologie IGVP, Fraunhofer Gesellschaft and University of Stuttgart, Rainer Oehme, Molecular Biology, State Public Health Department, Stuttgart and Joanna Zajkowska, Dept. of Infectious Diseases and Neuroinfections, Medical University in Białystok, Poland). 3D structure analysis of TBEV isolates from natural foci with reported severe autochtonic TBE cases: analysis included multi alignment and phylogenetic tree analysis (http://workbench.sdsc.edu) and 3D structure prediction analysis with HHpred (http://toolkit.tuebingen.mpg.de/hhpred). Amino acid sequence and amino acid exchanges are depicted in yellow.